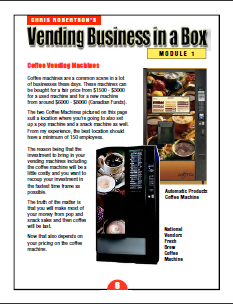 Learn How To Start A Highly Profitable Vending Business Today! I Will Also Help You Get Your First Location Too! If you don't get a new lead or prospect in the first 60 days of implementing my system then Just Ask For Your Money Back! Hi my name is Chris Robertson and for the last 20 years I have been operating my very own profitable vending business in Hamilton, Ontario Canada. Over the last 10 years I have helped thousands of people across the globe start their very own vending businesses themselves in their own local areas by providing them with the very best and up to date information about vending and providing them with the necessary tools to help them get started on the right foot. 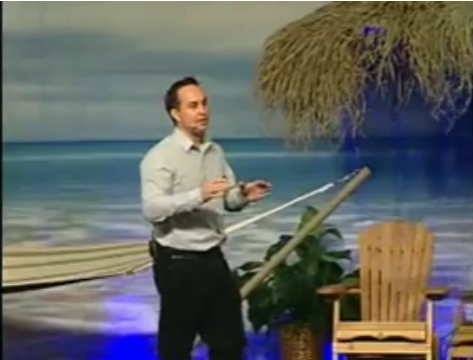 This picture was a live stage presentation that I did in December 2008 in front of 1300 of T Harv Eker's students in Palm Springs California! Today I will show you how you can take a simple soda vending machine and snack vending machine and make extra money for yourself so you can buy the things you want, provide a retirement income for yourself or just simply have extra spending money for the things in life that you enjoy doing. The truth is that Vending is a great way to make easy cash! Yep! that's right cash, because when your in vending you don't have to wait for checks in the mail or wait until payday to get paid. In fact you get paid each and every time to go and restock one of your vending machines. Also you don't have to wait for your BOSS to maybe give you a pay raise when it comes time for your review. You simply get a pay raise every time you place your machines on a new location and start making money. The Vending Business Is A Multi-Billion Dollar Business and Is A Simple Business where literally anyone can create an income and you don't need a University Degree to do it. Hey, Listen I am probably a lot like you. I had a full time job for many years driving a city bus and when I built my vending business big enough then that's when I fired my Boss. Yep! That's what the vending business can do for you. How many people do you know have left a full time job where they had great seniority, made $50,000 per year and had an excellent medical and dental benefit plan and just one day quit? Well that's exactly what I did and the only way that I could have done it was because I built a highly profitable vending business from scratch. ...and I'll tell you the down right honest Truth! The Vending Business is a great business but you need to work at it to make it all come together! It was like I can remember it yesterday, I was probably a lot like you working a full time job in a small town near my home in Hamilton, Ontario Canada. I had a job as a city bus driver and I made half decent money, had full benefits and pretty good working hours. I thought I hit a gold mine when I first started at that job and I honestly thought that I was going to drive that city bus until I was 65 years old and then retire with a full pension. Once I started getting my paychecks I just started spending. I moved out of my parents home, my girlfriend and I had a baby and then life hit me like a ton of bricks. Monthly bills and obligations, food, clothes car payments you name it things got real tight real fast! The thing was though I was only 20 years old and I had my whole life ahead of me. The job that I had allowed me to work split shifts where I had about 4-5 hours off from work in the middle of each day for recreational time. During that time I initially would just go home have a bite to eat and play with my son watch some TV. Then I would go back to work to drive the bus for the afternoon part of my shift. This was my routine for about 6 years. It was then a friend of mine from work who was running the pop machine at the transit yard had asked me to take over the responsibility of restocking this vending machine. He was leaving the workplace to pursue another career path in the financial industry. Long story short is that I started filling the pop machine each week with pop and bottled water. I knew nothing about vending. My friend had just showed me how to open the machine and how to load it with pop, then he showed me where to take out the money and that was it. He had told me where he bought the vending machine and to just go there if I ever had a problem. So needless to say I really had no idea what I was getting into. But as I went along each week filling this vending machine up with pop I started to realize how much money I was making for the amount of work that I was doing. It wasn't really all that hard to figure out. It All Came Down To Simple Math! and...The Minute that I Realized this Simple Yet Powerful Formula the Light bulb Went Off & I Never Looked Back! Here is the simple yet powerful formula that got me motivated to get out there and start making Real Money In Vending! I was selling 3 cases of pop each week out of my pop machine. My profit was $16.00 per case sold which = $48.00 profit each and every week just from one vending machine. ...so then I thought what if I could set up 10 more vending machines and sell just 3 cases of pop each week from them? That's $480.00 Cash in my pocket! How about 20 vending machines = $960.00 each week! I Was All in for Vending! When I really thought about it... for the amount of money that I was making each week I really only put in about 20 minutes of actual time and work to restock the machine and buy product. In all honesty I was making $20 bucks per hour driving the city bus and I worked about 35 hours per week. By the time the government took their cut and the Union took their dues I was left with about $500 each week. So I though about it and if I were to get out there and just get 10 locations to set up, the amount of time that it would take me to restock my machines and buy my products each week would be about 30 minutes per location. That's 10 locations x 30 minutes per location = 300 minutes which equals 5 hours of actual work and if you really think about it's probably less. So Let's Get this Straight that's 5 hours of work for $480.00 Cash! hmmm... I was working driving the city bus 35 hours per week to make the same amount of money! It's definitely not rocket science to figure out which way to work is easier! It's true when people say your vending machines are working for you while you sleep. They are what I would like to call my... Passive Income Money Stream! Once I had this realization I immediately went and talked to the vending distributer where my friend bought my pop machine. I asked a few questions and they guy who ran the place just told me to get out there and start knocking on doors to get some new business and my vending machines out on location. Truth is... I had No Idea what on earth I was doing! I had no business or sales experience and I didn't even know what to say to people when I approached them about my business. I was literally stumbling over my words probably not making any sense at all! But the cool thing is that I did get locations and started to build my vending business. When I started I initially just wanted to make some extra cash and keep my bus driving job. But after a while once I had a few locations I began to think about vending as a full time income source of income and the possibility of quitting my full time job. You see I knew that every location was different when it came to how much money that I was going to make. I had some locations that made me $100.00 a week but then I had a few that made me $500.00 a week. That's Profit Not Sales! So I knew that this opportunity was real! Because I had seen it with my own eyes! Look I'm not joking here! There is money to be made in vending and my example that I showed you earlier was just a taste of what you can make in the vending business. I must admit though in the beginning I was stumped! There were a lot of other vending companies operating and for the most part many local businesses that I approached all ready had vending machines. I was sure that it would take a long time to get enough locations to quit my day job and go full out in vending. But I knew in my heart that there must have been a way. After all how did all of these other vending companies get their locations. Plus I had locations all ready making me good money, so I really just had to duplicate my efforts! The Answer Was Simple! I Just Took Action and My Business Kept Growing! 1. Am I looking for a business that I can work part time? 2. Do I want to make extra money to help pay for things like my monthly bills mortgage or rent? 3. Do I want to have extra spending money every week? If you answered Yes to any of these 3 questions then Vending could be the answer for you! Vending Has Allowed Me To Pay My Bills & Have Spending Money Each and Every Week! I had heard stories of vending operators who raked in thousands each week all cash! So I started to do some homework and began to look deeper into different ways to expand and build my business. I spent hours, days, weeks and many months diving in to learn what I needed to learn to build my vending business. and... I did just that! I had created a simple yet powerful vending business lead system that brought new prospects to me instead of the old way that I used to build my vending business by cold calling and chasing them. The results were phenomenal and I honestly couldn't believe that the next things that were going to happen to me did. As soon as I started to implement my new found vending business lead system things started to change. My telephone started ringing, e mails started to pour in and local businesses were actually calling me asking me to bring in my vending machines into their business. Within an 18 month period I had literally exploded my vending machine business to new heights! ...that even the newest person starting in vending could easily understand and implement in their own local area! Use My System, Follow What I Tell You & Get Results That's All There Is Too It! All it takes is for you to start divulging the information that I have for you today and take Massive Action... If you follow my instructions the end result can be you getting new locations, setting up your vending machines and making money in the process! If you can follow some simple steps and follow my Action Plan then you have a Blueprint to make money on demand in the vending business. I am going to show you not only how to get Free Vending Machines but I will show you the easiest and fastest way to get new leads and locations! Once you get local businesses contacting you inquiring about your vending services then you have many options at your finger tips. Option # 1 - Sell the lead to another Vending Operator! - I sell my leads that are out of my working area for a price of $100 - $300 per lead. Now you can do the same. Option # 2 - Set Up the locations with machines and sell the location to another Vending Operator. - I currently sell locations for $4000 - $5000 for a location with one pop and one snack machine on it. Option # 3 - Set up the location and make money from the sales of your machines. Most of my locations make me anywhere from $75.00 - $100 per week. Let Me Help You Get Your First Location! Check Out What I Have For You Today! Don't Skim By Bonus # 2 & 3 Either! This is The Most Critical Part To Your Success In Vending! Here is what I have for you today! First I have put together a complete Vending Business Training System. I have put together a multitude of various information for you to divulge such as my vending Business Tactics e book, audio training lessons and even video coaching lessons for you to use and learn to start your very own vending business. I have also thrown in some great bonuses that also include Personal Coaching and Direct Help from me to get you new locations so you can start making money in the fastest way possible. I have taken everything that I know about this business and structured it in such a way that literally anyone who is willing to spend some time to educate themselves and divulge this information has a serious opportunity to create an income for themselves in their own local community starting today! There is nothing like this out on the market today! I Know this Because I Dominate The Vending Business Training Space! This is the reason why T Harv Eker's Company asked me last year to speak and teach his students at his "Never Work Again" event in California to over 1300 of his students. His students paid upwards of $2000.00 to attend this event. Just Type T Harv Eker into Google and see what he is all about. He is one of the world's leading thought leaders and experts in teaching people about wealth creation! So Here is What I Have For You Today! 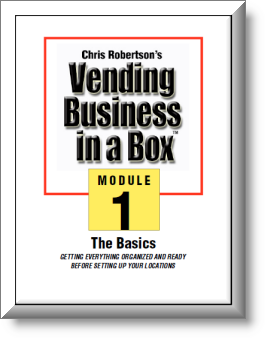 It all starts with a simple to read E Book that explains everything that I know about vending. How to find locations for your vending machines: I will show you 6 ways! How to get your vending machines for FREE! How to get started even on a tight budget! How to buy your machines for the best price and where to find them cheap! How to get your prospects to call you first! How to avoid paying commissions to your locations! What vending machines are the right ones to buy! How to spot vending opportunity scams & avoid them! How to rent your vending machines instead of buying them! How to pay off your vending machines quickly! How to make real money in vending! How to get your locations to subsidize the sales of your products! How to keep any competitor away and never lose a location! How to maintain your vending machines to keep them running for the long haul! New versus used vending machines. The difference and pricing! How to expand your services to your locations and make more money! How to sell your locations, leads or even machines to make the most money! How to keep your costs down. How to get more referrals to expand your business. All of my information will apply to you whether you live in the United States, Canada or across the globe! Next I have put together some Very Special Bonuses that will I believe will enable you to make even more money in your vending business. I have structured these bonuses in a way that will not only teach and train you through some personal coaching plus a series of audio trainings and even video coaching to help you start your vending business on the right foot. * I have also put in a very special bonus to help you get some new locations for your vending machines! Just to make life a little easier for you. Free 30 Minute Coaching Session With Me! This is where I will get right down to work with you to develop your game plan for starting your vending business on the right foot! I will exhaust all resources to get you start making money as fast as possible! I will also record the session and send it to you so you can listen back to it anytime you want! Trust me you will learn more in this coaching session than most vending operators working their business know today! I'll tell you right now that many people that get started in the vending business without taking the time to learn and educate themselves before diving in, some will end up making costly mistakes. But I don't see you making those mistakes today because once you become a student of mine you will have direct access to the best information about vending on the market today! Trust me this Bonus above is what is going to make your life a whole lot easier. I'll tell you right now that the most common question that I get during all of my Vending Business Training calls is "How do I get good locations?" Well this Bonus is the answer! I am going to put together an Action Packed Video for you to help you get Prospects calling you for your vending services in your local area! I will create the video, put music to it and put in your phone number or website information. Plus I will Upload It to You Tube and Focus On Ranking It In Google For You. Just tell me what contact information you want in there and I'll do it. This is a quick one minute video that I got ranked into Google page # 1 in my local area. Local businesses who type in keywords into Google looking for vending services can now find me by watching this video and then contacting me to inquire about my vending services. This Will Help You Get Your First Location! 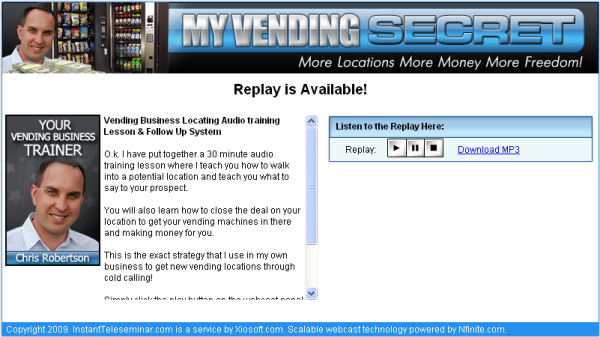 Vending Business Locating Audio Training Lesson! In this30 minute audio training lesson you will learn how to cold call potential locations in your community. I role play with you telling you the exact words to say to your prospects about your vending service company and also how to follow up and close the deal on your potential locations! I wish someone would have shown me how to approach potential vending locations and shown me what to say to people when I walked in years ago when I first started. Now you will have access to the best prospecting and locating information out there. Office Coffee Secrets E Book! Selling Office Coffee as a service to your locations can make you some excellent cash! It's easy to do and a lot of my locations give their staff Free coffee. I will show you how to make an extra $500 per week by just dropping off a few cases of coffee and some other coffee products to your locations! This is an easy to read E Book that you can read right on your computer! Selling Office Coffee is Easy and is Great Money! In fact I know other vending operators that almost exclusively have changed their business from vending to ALL Office Coffee. The reason being is that the brewers are easy and simple to set up and local businesses spend a fortune purchasing coffee for their staff. Water Cooler Rental Secrets Audio Training Lesson! How would you like to learn how to make $35.00 over and over again each and every month from each water cooler that you set up? The best part is that this is a set it and forget it systemthat runs on auto pilot! I am going to show you how to do it 10, 20 & 30 times over! Just take a moment and think about if you only had 20 water coolers in local businesses in your area on a rental basis? Think about that! 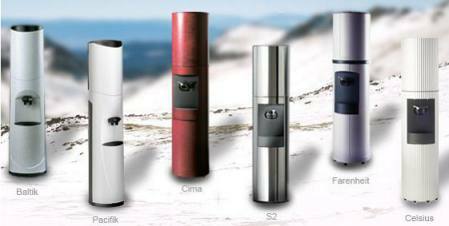 Even if you only had 1 water cooler out on location your investment in my product will be paid for in less that 60 days! Is that cool or what? 10 of My Very Best Business Proposals! These are 10 of my very best proposals that you can start using in your vending business today. Just simply edit them the way you want and use them as you please! These proposals are the exact ones that I use in my business today to close the deal on new locations. You get them today and can start using them in your business. They are laid out on a Microsoft word document so that you can simply plug in your information and then print them or e mail them to your prospects. It's that easy! Kitchen Supply Selling Strategies Video Tutorial! 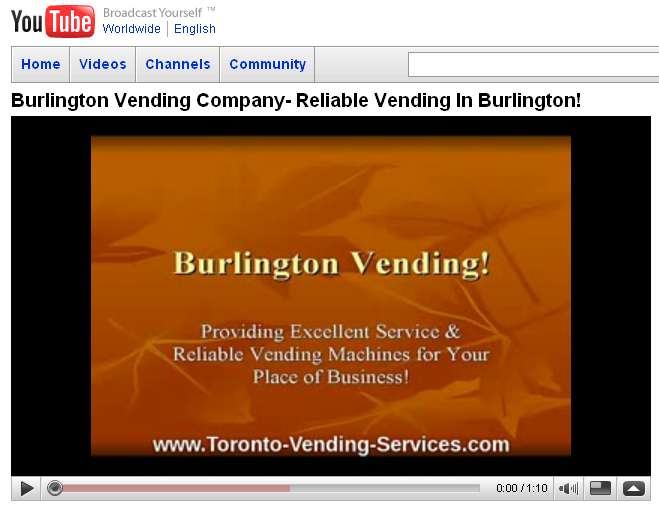 Vending Business Video Coaching Program. This is where I show you my exact system for making more money at each of your locations without spending a dime selling Kitchen Supplies to your accounts. In this Very Special Video Tutorial I show you how you can make an extra $900.00 per month from just selling a few products each week to three of your vending accounts! Once You Order I also have A Very Special Bonus for You! - Exclusive VIP Access to my Monthly Coaching Q & A Vending Business Training Teleseminars! Your In FREE! I have included this bonus simply because you have shown me that you are a person who takes Action in their life! The fact that you took the time to read my sales letter today and made it to the bottom of this page shows me that you want to make a difference in your life! So once you take Action and become a student of mine... Then you will reap the rewards greatly for receiving personal help from me during my Monthly Coaching Q & A Vending Business Trainings Calls absolutely Free! This is where you have direct access to me to ask me any questions that you want! If you are still sitting on the fence here are what some of my students are saying! Your information saved us $20,000 as we were in the "process" of buying some machines from a company that really hyped up their business. Luckily your timely information nailed it for us as we didn't follow thru with the final process! I had to take the time and thank you for all of your help with getting me started in the vending business. Before I even spent one dime I learned so much from your free Teleseminar and free report. The value for your e book is incredible! To include your support via email and phone is priceless. Thank you so much for your honesty and value!! I downloaded your e book last night and I was very impressed with your straight forward approach. I almost spent $10,000 on a few combo machines last month at an opportunity show and I am sure glad I didn't! I will now get straight to work on the things that you suggest. 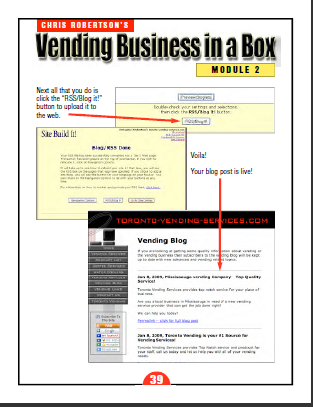 Your e book was very useful and gave me some great ideas on how I am going to start my vending business. I now know that soda machines are the way to go! I would definitely recommend your book to others. I wanted to let you know that after reading your book I bought my first pop machine last week. I used your techniques as you described and found 2 locations. I will be setting up my other location in a week or so. Appreciate your ideas and info! It is really great to see someone like yourself offer this kind of information. I have been to a few opportunity shows in the past and they wanted me to buy, buy, buy right there on the spot! I'm sure glad I didn't! Your information was very helpful. I want you to have access to some great information about the vending business? Here is My Personal No Hassle, No BS, I'm Going To Help You Extended Guarantee! My Goal Is To Help You Build Your Vending Business and help you start making money in the fastest time frame possible. In doing that not only do I teach you how the business works and tell you what to do to start making money immediately but I also provide you with Personal Help directly from me. This is what I believe will set you apart from the pack! So... First... I have my regular Guarantee that within 60 days if you feel that my information isn't all that I say it is then you can simply ask for a No Hassle Refund! Plain & Simple! Second... If you use your All of your Bonuses that I provide you with in my Vending Business Training System and You Don't Get at the very least One Single New Lead or Prospect that contacts you regarding your Vending Services within the first 60 days of using Bonus # 2 and Bonus # 3 then I will give you Direct Access To My $1997.00 Vending Business In A Box Training Course Absolutely FREE! In this content Rich Training Course I deliver over 15 hours of training that comes complete with Step by Step "Study Guides" that walk you through my Exact Process for building a 6 Figure Vending Business. I Sold This Training Course at T Harv Eker's Event Just Last Year for $1997.00 and You Will Get It FREE! I'll tell you right now that if you were considering going to your bank for a loan or a line of credit to start your vending business. Most banks will ask you for a Business Plan. If you don't have a good business plan you may not get approved! Today when you buy my product you will have enough information available to you to create a very detailed business plan. This information can help you craft together your business plan so that you can get the funds that you need from your bank to start your vending business the way that you want to. It's to your advantage if you have some money to start in this business. You don't need tens of thousands by any means but having a small pot of cash to get you started will make life easier for you. Also Once You Order I have A Very Special Bonus for You! - Exclusive VIP Access to my Monthly Coaching Q & A Vending Business Training Teleseminars! Your In FREE! I have included this bonus simply because you have shown me that you are a person who takes Action in their life! The fact that you took the time to read my sales letter today and made it to the bottom of this page shows me that you want to make a change in your life! You see having a coach to help you in your business is paramount. Your coach is the one person who can help you to stay on track and motivated to keep building your business. As your coach I will answer your questions to help you achieve success and your next step in your business. And that's what you're getting today - an expert mentor to show you what to avoid, what works and the QUICKEST, EASIEST path to wealth in the vending business. If you are looking to start a business that's easy to get into and isn't going to cost you a fortune to get started then vending is for you! If you are simply looking for a way to earn more money each month to pay things like your utility bills, car payments and and things like that then vending is for you! If you are looking to supplement your retirement income then vending is for you! If you are looking to have extra spending money each month to help make things easier then vending is for you! Let's Recap for a moment exactly what your getting with my Vending Business Training System! (Free) Personal 30 Minute Coaching session with me! I will Make You A Video To Promote Your Business! 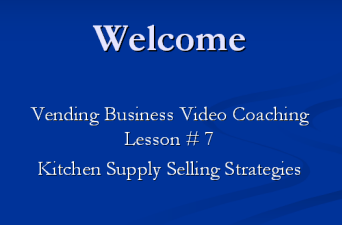 Kitchen Supply Selling Strategies Video Coaching Lesson! Free VIP invite only Access to my monthly Q & A Vending Business Coaching & Training Teleseminars! Please note that all my Vending Business Training System and the Bonuses are a delivered to you digitally. That means you will have access to All of this information once you fill out the order form and check out right on your computer. There is nothing to deliver via mail service! I am going to show you how to get your vending machines for Free! That's Free Money in your pocket when you set up your locations! You don't have to buy your machines! I am going to teach you everything that I know about the vending business! This is your chance to make a change in your life and get into the vending business. There is a huge opportunity waiting for you and you can start making money even on a part time basis just like I did and thousands of others have. I have taken all of the bumps and bruises over the years and I know what works and what doesn't. This information that I have for you today will save you all of the frustration that I went through in the beginning when I first started. YES, I Want To Make Money In Vending And Become One of Your Many Success Stories! Yes! Sign Me Up! - Please give me immediate access to your "Vending Business Training System" for just one easy payment of $47.00, I know that I am backed by your 60 day money back guarantee! Yes!I understand that I am getting access to your Vending Business E Book, audio training lessons, video coaching and All Bonuses as soon as I complete my order! Yes! I want to learn all of your vending secrets starting today! Yes! I understand that I get direct access to you Chris for a Free 30 minute coaching session to help me get my vending business off the ground! Yes! I know that I get access to your Locating audio training lesson to learn how what to say to potential locations in my area to get new prime vending locations! Yes! I want to learn how to make an extra $500 per week selling Office Coffee to my vending locations! Yes! I understand that I get access to your Kitchen Supply Selling Strategies Video Coaching lesson so I can learn how to make $900 per month selling kitchen supplies! Yes! I want to learn how to make easy money setting up a few water coolers in my local area and can make Massive Passive Income each and every month! Yes! I understand that you are giving me 10 of your best business proposals so that I can use them in my business to help me get new locations! Yes! I know that I may need some help along the way and that you are giving me Free Vip Access to your Vending Q & A trainings calls too so I can have direct access to you to get my questions answered each and every month! Yes! I understand that I will have the best chance to succeed in vending because I have access to all of these vending business training tools to start making me money in vending right away! Total Value to you in excess of $1900.00 and yours RIGHT NOW for just the small, ONE-TIME, ONE-OFF investment of the $47.00.. I have a FULL 60 day money back guarantee, and no one is allowed to ask me anything or try to pitch me something else if I decide to ask for my money back. 7 Real Signs That You Need My Vending Business Training System! #1. Your struggling to make the money that you want! #2. Your looking for an easy business to start that will make you CASH each and every week! 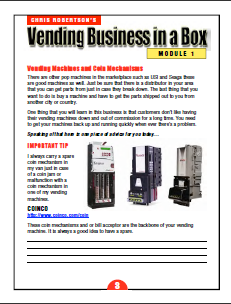 #3.You want the Best Information on Vending without having to spend a fortune! 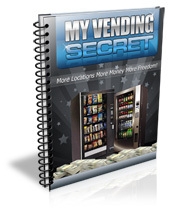 #4.You finally want to discover the key secrets in vending that are being kept from you! #5.You just need some personal help to start seeing money coming in! #6. You simply need someone to steer you in the right direction of what works! 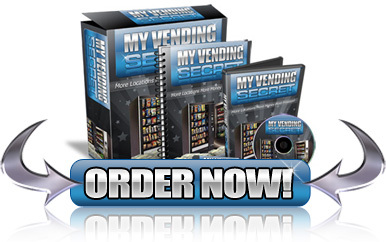 #7.You're sick of spinning around in circles and just want the INSIDER info on how to make money in vending right away! When you buy my product today you will stand a great chance for success in this business. Plus you will avoid all of the mistakes that I made when I first started. 1. You will over pay for one or more of your vending machines! 2. You will buy a location from someone and over pay again! 3. You will buy the wrong type of vending machine for your business! 4. You won't learn how to get vending machines for FREE! 5. You most likely will struggle trying to get your vending business off the ground! 6. You will be like most vending operators out there struggling to get new locations for your vending machines! I know that you don't want to make mistakes like that do you? If your starting a business you will want to make sure that you have the best chance for success right? Yes! Chris I Want To Learn Your All of Your Vending Secrets Right Now! You will have access immediately after you order right now even if it is 3:oo am. I have been to major franchise shows in the past and as I went from booth to booth at these shows the average investment to get into any of theses businesses ranged from $15,000 - $30,000. Plus they all had yearly franchise fees of thousands of dollars attached to each business. Where else can you start a business that costs under $100 bucks and can Make You Tens of Thousands of Dollars Very Easily! I don't know of any myself! What I can tell you is that if you start out slowly building your vending business one location at a time and you follow what I tell you in my Vending Business Training System then you will stand the best chance for success. I am here to help you in any way that I can and steer you in the right direction. If you have questions feel free to send me an e mail and I will get back to you promptly with an answer. p.s. What I have put together for you in this up to date product in my opinion is by far the best information out there on the market about the vending business. At the end of the day! Whether you buy my information or someone else's it's all up to you to take action in your business. If you do then things will happen for you. If you don't then please don't expect to make money in vending. I'm just being honest!